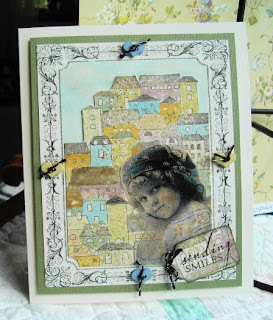 Hero Arts has a monthly challenge and this month it is “Watercoloring with Distress Inks”. This is a “Cased Card”, from a very talented lady, Jacqueline at www.myscrapbasket.blogspot.com I bought this Hero Arts stamp sometime ago and didn’t really know what I wanted to do with it, and after seeing Jacqueline’s card I went nuts… Love it now, and will try it again. 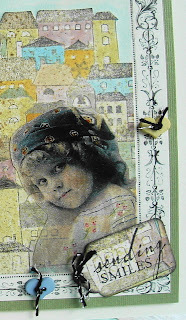 The printed frame is from “The Graphic Fairy”, and the little girl is from “Magic Moonlight”. She was printed on acetate and dusted with white Pearl-X on the back. The “Sending Smiles”, stamp is also from Hero Arts. Have a “Cool” week, temps here in the high 90’s today and very humid. What a beauty!! I adore your card. So pretty Vada, those little houses are adorable.